Hi! I am Penny…a wife (to a wonderful man), mother (of 4), stepmother (of 3), full time employee, and a runner. I started running in 2001; well, you couldn’t call it running back then. Huffing would be more appropriate! On January 11th, 2002 I stopped smoking and my huffing slowly turned into running. A few people that we (the hubby and I) worked out with during lunch decided to train for the Arnold’s Classic Pump and Run. In March of 2004, I completed my first one. We followed that up with another one in 2005. In between I have participated in many 5Ks. After watching my sister in-law complete the Columbus Marathon in ’04, I had a brain cramp and decided that I should train for a 1/2 marathon. I completed the Capital City 1/2 Marathon (April ’05) in 2 hours and 28 min. After that I took almost a year off from running, I was simply burned out. In ’06 I decided that I had gotten fat enough (gained 30 lbs) and decided to train for another 1/2, which I completed in March of ’07 in 2 hours and 45 min. With my husband’s blessing and support, I trained for my first full marathon! The Columbus Marathon, which was held in Columbus, Ohio on October 21st, 2007. I did it and since then have run over 30 half marathons and four full; including the “Goofy Challenge” at Disney. In ’10 I joined a small non-profit running group and made a lot of running friends. In March of ’13 I became an RRCA certified running coach. I followed that up with a Team Oregon Running Certification later that year. 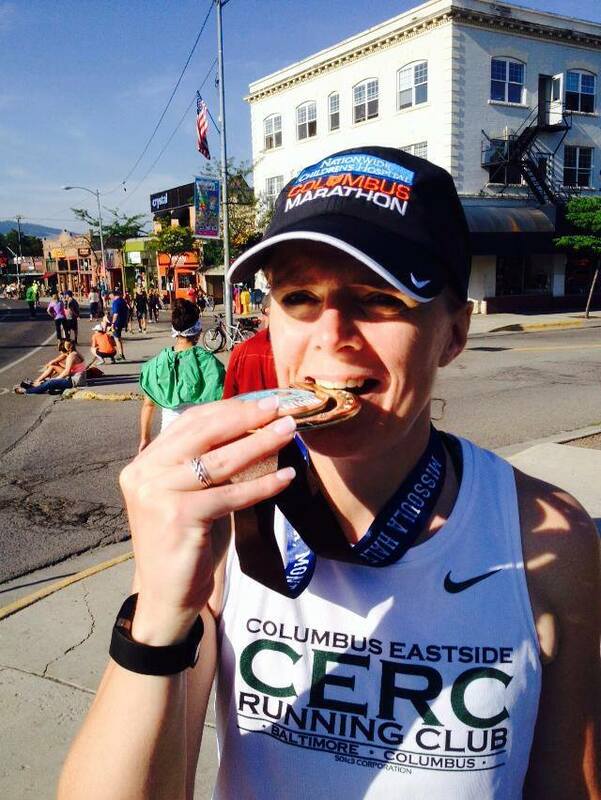 In ’14 I became the Membership Director of that non-profit running club (Columbus Eastside Running Club). We have about 170 active members. If I could do this for a living, I would quit my job in a heartbeat! Thanks for visiting my blog – I am jealous not only of your weightlifting but your consistency (and your understanding boss). It’s all I can do on the weekdays to get 4-5 miles in on my lunch hour at work, and then I don’t have time to eat anything! I think you might have inspired me (note my hedging here, but really, I mean it) to get up on Sundays and run with the local club for long runs. Running alone is spiritually fulfilling for me, but I need someone to push me through some quality long runs. Good luck in Columbus – a great PR course! Keep up the excellent work; I enjoyed reading your training routine. Keeping a good record of all your hard work is a great way to keep you motivated and moving in the correct direction. You give me hope that I will get out and start running again. I am glad to see that you are still keeping good records. How is your side feeling? I see that you ran 5 miles on the 17th. I hope you will recover soon. It was great seeing you at the Mall the other day. Wish we had more time to visit. I wanted to let you know that I have started running again. Today I walked two miles and ran two miles, along with lifting weights. I have been building up to it for a while. I hope I can work up to a 5 mile run. And then, I will go from there. Take care, will talk will you soon. I want to be ready if big “D” does the pump and run next year. You know big “60”. It was great running into you and your family as well. You looked good! My side pains are much better now, and perhaps are gone for good. I am going to follow up with my doctor to see if I have to research it any further or if we should just let sleeping dogs lay. I am looking forward to running with you one of these days…keep up the good work! I like your running blog! I have a running blog that I just stared in addition to the one listed. my running blog is at: runFastLanerun.blogspot.com Keep up the running! hey, i wanted to reply to a post you left on my blog, but i’m new to this blogging thing and i’m not sure how to reply so that you will see it. i wanted to thank you for the well wishes on my run – i did it this morning and i feel really good about it. 10 miles – 1:46:58 – slightly slower than previous race paces, but who cares??? i ran 10 frackin’ miles! i’m starting to feel that the halfie is in my reach! i’m also going to keep reading your blog, i like to hear what “normal” people are doing with their running and training, so i find your writing interesting. thanks again!